(by Josh Lederman, Associated Press) WASHINGTON — …Unlike the six State of the Union speeches he’s given before, President Obama plans to skip the traditional list of grand proposals, new policies and presidential appeals for new laws in favor of a bird’s eye view of what he has accomplished since 2009 and what’s left undone in his final year in office. Aides said the president on Tuesday night will give his assessment of what the country looks like in 2016 and the direction he hopes it will take in the future. To the extent he can, Obama will also try to give a burst of energy to initiatives he is hoping to push past beyond the life of his administration. This year, to keep the momentum going, Obama must contend with a presidential campaign that, as typically happens, is already reverberating loudly and will only get louder. The White House scheduled this year’s speech earlier than usual, in part to ensure Obama had room to run before voting starts with the Iowa caucuses on Feb. 1. To the dismay of some in his party, Obama doesn’t plan to use the address as an opening argument for Democratic candidates in the November election. White House officials pointed to his speech at the Democratic National Convention in July and his first rally for the Democratic nominee as his opportunities to frame the campaign. Obama’s best prospects for achievements this year are on the few issues where he and Congress at least partially agree. Central to his speech will be a renewed call for a criminal justice overhaul and for approval of his Asia-Pacific trade agreement, which many Republicans support (and many Democrats oppose). He will face a less receptive crowd on foreign policy and homeland security. Republicans and even many Democrats have deemed his strategy for fighting the Islamic State group half-baked and feckless. Obama insists he hasn’t abandoned his campaign promise to close the Guantanamo Bay prison, although GOP opposition that has been codified in statute makes that difficult to fulfill. Last year the White House said Obama would send Congress a new plan for closing the detention center, but there have been seemingly endless delays. Though viewership of the State of the Union has declined, Obama’s speech will still feature plenty of pageantry, including special guests invited to watch from the House viewing gallery. The White House said two people who inspired Obama during his first presidential campaign would be attending and that a seat in the first lady’s box would be empty to honor gun violence victims. Republican Gov. Nikki Haley of South Carolina, discussed as a potential vice presidential candidate, will give her party’s response to Obama’s address. Obama plans visits to Nebraska on Wednesday and Louisiana on Thursday to make the case for his priorities. NOTE to students: Read the information under “Background” and “Resources” below before answering the questions. b) When and where is the State of the Union given? 2. How is President Obama’s last State of the Union tonight expected to differ from his other State of the Union addresses? 3. a) What do Democrats want the President to use the address to do? b) How do White House officials explain the President’s decision? c) Do you think the President should make this part of his State of the Union? Explain your answer. 4. What issues are expected to be central to President Obama’s speech? b) Do you think this is a fair description? Explain your answer. 6. a) Which of the following issues do you think are most important for President Obama to focus on in his final State of the Union? Explain your answer. Americans concern that terrorists could enter the U.S. as refugees; his decision to greatly increase the number of refugees from Syria and other countries to the U.S.
b) Ask a parent what issues he/she thinks President Obama should focus on in his State of the Union, and to explain his/her answer. 1. Tone is the attitude a speaker takes towards a subject. What was the tone of President Obama’s 2016 State of the Union address? 2. What was the overall theme of the president’s speech? 3. List some of the things the President promised to do in his last year in office. 4. Which issues of importance to the country did the President bypass altogether, or just mention briefly? 6. a) Do you think the President is focusing on the correct issues? Explain your answer. 7. Watch/read the Republican response to the President’s State of the Union at sotu.gop.gov or c-span.org. What do you think of South Carolina Governor Nikki Haley’s response? George Washington gave the first state of the union address on January 8, 1790 at the Federal Hall in New York City. Franklin D Roosevelt called the speech the “State of the Union” in 1935. In 1947, Harry Truman, FDR’s vice president – who succeeded him as President, was the first to broadcast his State of the Union address on television. It is customary for the opposing party to respond to a President’s State of the Union address. Washington House Republican Conference Chair Rep. Cathy McMorris Rodgers will give the Republican response to President Obama’s State of the Union Address. Watch Gov. Nikki Haley’s response at: gop.gov/sotu or c-span.org. Conservatives generally oppose the President’s policies. For a conservative perspective of President Obama’s speech, go to the conservative website NationalReview.com. 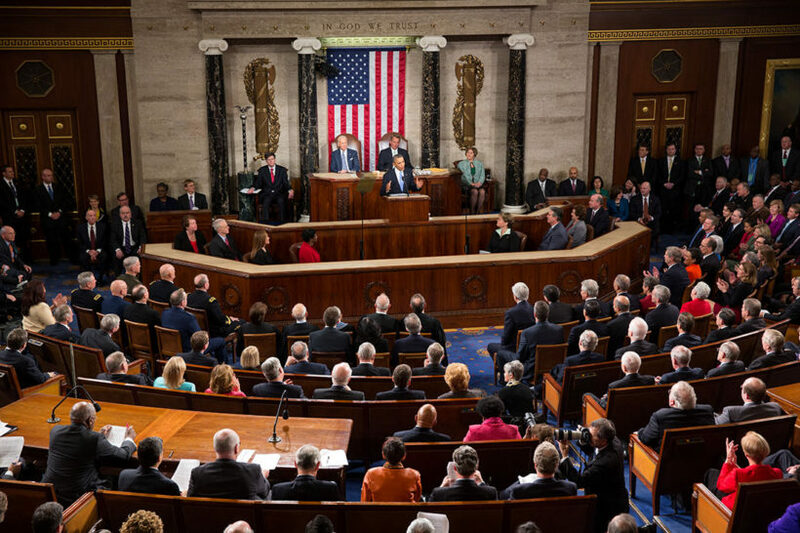 For information on Presidential State of the Union Addresses, go to AmericanPresidencyProject.